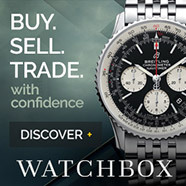 Now this is a very cool watch that is coming out, from one of my favourite value-oriented Swiss Watch companies. 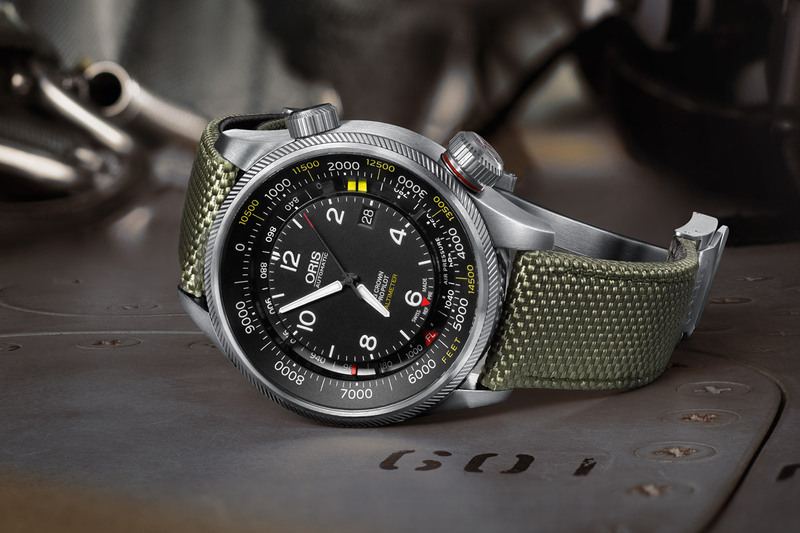 It is the world’s first automatic mechanical altimeter watch, quite the feat for a company like Oris, considering there are so many other Swiss watch companies with roots in Aviation. The altimeter is activated using the side-mounted Altimeter crown, and it can measure altitude up to 15,000 feet or 4,500 meters. The units will depend on which model you have, feet or meters. Such a cool feature that I probably won’t use much, but would love to own. Kind of like the Panerai Depth gauge. I usually identify Oris with their Dive watches, as their Pilot offerings in the past have not impressed me… this is different. There is a good chance I will be getting one of these! Oris celebrates its 110 year anniversary with a bang, by introducing its first fully in-house developed mechanical movement in 35 years, the aptly named Caliber 110. It features a 10 Day power reserve with non-linear power reserve indicator and small seconds. Limited edition of 110 pieces in steel and 110 pieces in 18k rose gold, both featuring 43mm cases. 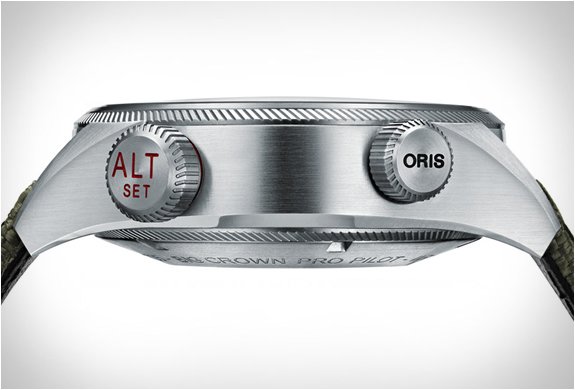 Love this little statement piece from Oris, understated, but impressive. An oldie but goodie. 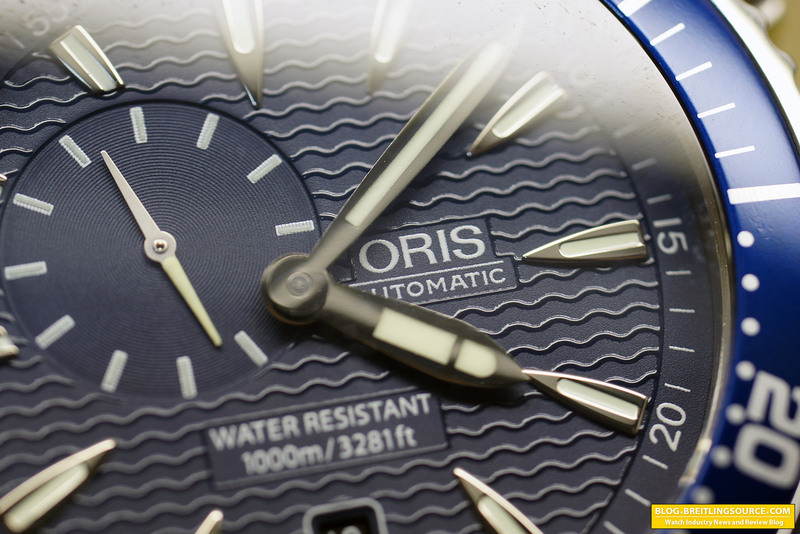 The Oris TT1 series of watches are some of the best bang-for-buck Swiss Automatic Divers on the market – and yes, that includes all those boutique divers out there that everyone gets all giddy about too. 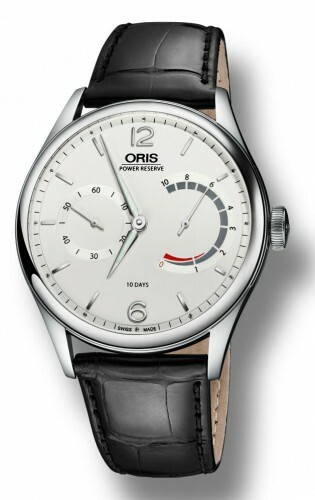 Oris watches are bonafide, reliable and reputable Swiss Timepieces, and they’re much better made than brands like Hamilton. Got this great shot of the dial, which really does the watch justice. It captures all the detail and colors just right, except I left some fingerprints on the edge of the bezel between 10 and 11 o’clock. Great dual-crown look, with the offset small seconds at 10 o’clock and the actual crown at 4 o’clock with the manually operated helium escape valve at 2 o’clock. 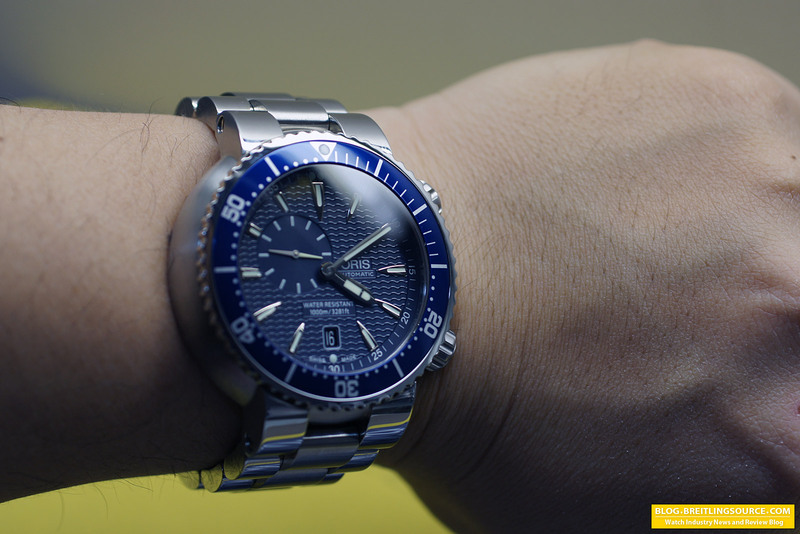 The dial is a beautiful slate blue, with waves on it as you can see, with the date located at 6 o’clock. An angle shot, so you can appreciate the shape of the stainless steel case, and see the signed crown and blue dot on the helium escape valve. 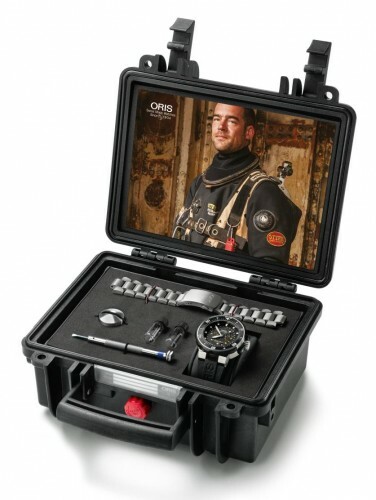 The case has the familiar Oris ProDiver “bubble” shape, which makes the 47mm case wear more like 44mm. It is nice and thick, however, and feels substantial on the wrist. A nice close-up of the dial, showing off the fine-printing and gel-applied waves of the dial in detail. The crystal is double-AR coated, and gives off a blue tinge. Lume is excellent, and works well when charged, though the luminous markers are not especially big. Another better shot showing the “bubble” cushion shape of the case, with the screwed-in end links that hold the stainless steel bracelet on. Those screws can be hard to remove and require two screwdrivers and a vise to remove! I prefer this stainless version of the Oris TT1 ProDiver over the Titanium one that I had owned before, because I found that the finish looks nicer and its a better weight. The nice, substantial button-lock deployant clasp is shown above, and its pretty darn good looking for a watch in this price range. They’re almost as nice as the Omega Seamaster buckles – almost. I can’t tell for sure if they are thick stamped buckles or machined, but my guess would be stamped. The caseback is a solid stainless steel affair, with the general watch features on it such as the 1000m water resistance, stainless steel case, sapphire crystal and Swiss Made designation. It also has the model and serial number on it. As you can see, the 47mm diameter doesn’t look imposing at all on my 6.75″ wrist. In fact, its no bigger looking that my Chronomat 44, though it is a bit thicker. I really like this watch, and for the amount you can snag these on the secondary market, they are a bargain. 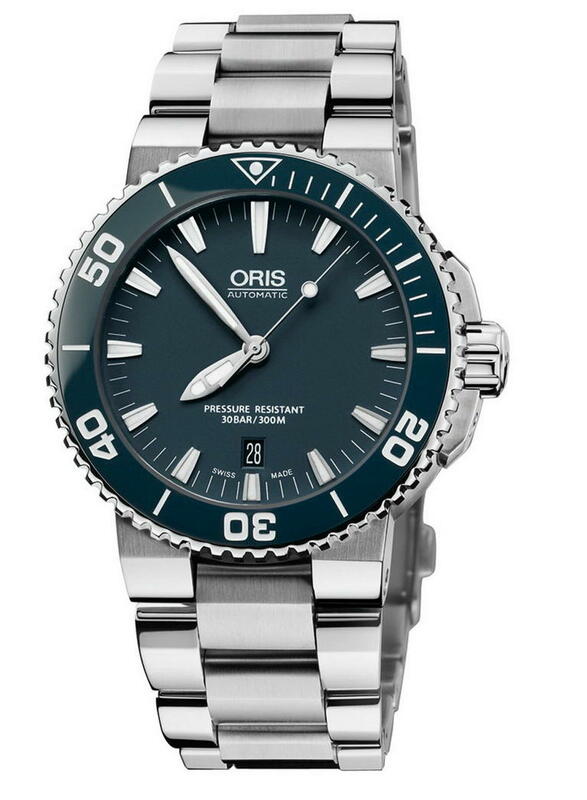 With the new Sapphire bezel Oris models now available, these can be picked up for a song. If they’re in your wheelhouse, I think they’re well worth considering. A new, more complicated watch from Oris one of the great values in Luxury Swiss Mechanical watches. The ProDiver Pointer Moon is the World’s First Mechanical Watch to Indicate Both the Lunar Cycle and the Tidal Range. 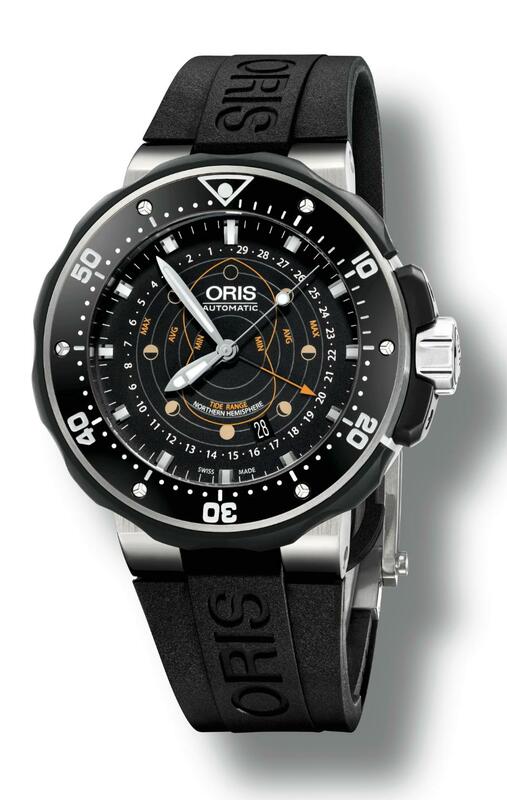 The watch is developed in cooperation with Oris brand ambassador and commercial diver Roman Frischknecht. The large Titanium case measures 49mm, with a Ceramic bezel inlay. The watch is water resistant to 1000m, and features a helium escape valve. 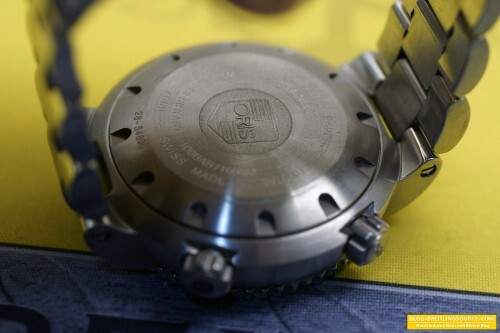 The movement is an Oris Caliber 761, base movement Selitta SW220. 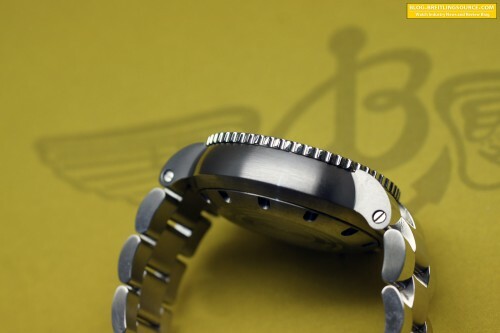 The watch comes with a presentation case with all sorts of bells and whistles and tools to swap between the titanium bracelet and rubber strap. 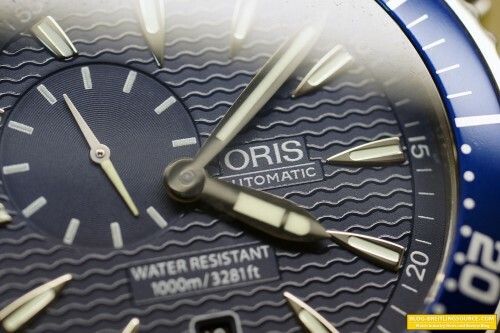 Oris has revamped the Diver line with new Ceramic Bezels and updated cases. 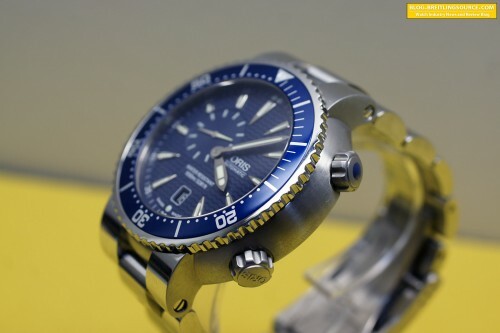 The new Aquis line features Stainless Steel Cases and Sapphire crystal and water resistances to 300m. They have added screwed-in crown guards for an extra touch of sophistication and a bit of faceting on the lugs as well. 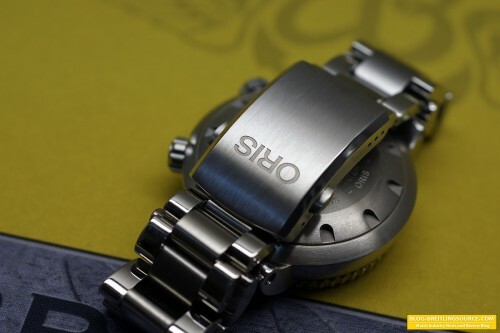 Nice looking pieces that update the look while still remaining quintessentially Oris in design. There are two sizes available, a full size mens model at 43mm and a women’s sized model at 36mm. They are also available in two colors: Black and Blue. 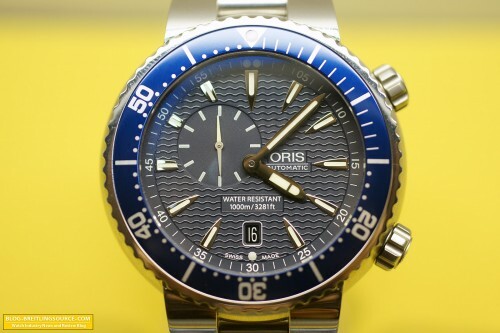 The photos appear to make the ceramic bezel insert on the blue model look glossy, while the ceramic bezel insert on the black model looks to have a brushed finish. Nice distinguishing features I think. The watches continue with the integral style bracelets with an option for rubber as well. I like that they don’t have the rounded cushion sides that the older TT1 style had. I think that was my biggest dislike of the previous case. While I owned a couple and did really like them, the rounded case sides eventually started to bother me. 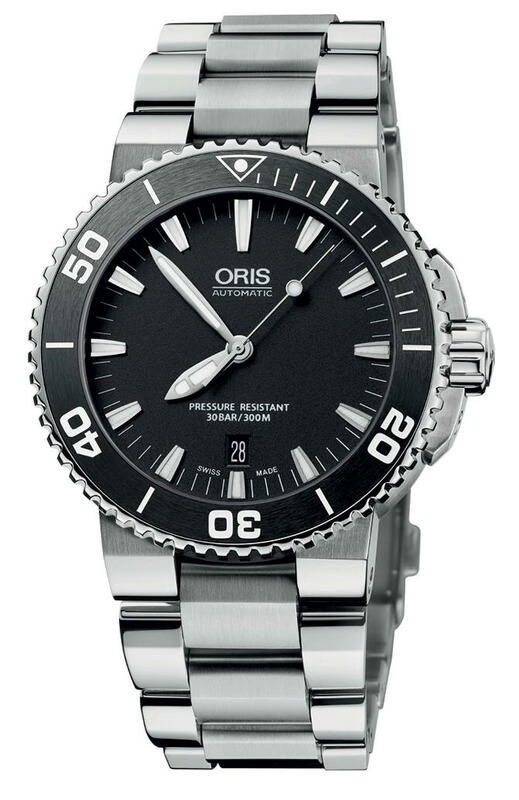 Retail on the 43mm model is about $1,900US and $1,850 for the 36mm.